Product #21792 | SKU HPRC2780WEBLACK | 0.0 (no ratings yet) Thanks for your rating! 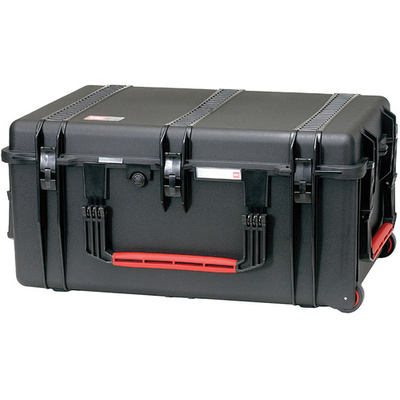 The HPRC (High-Performance Resin Cases) 2780WE Hard Utility Case (Black) is designed to carry and protect cameras, camcorders, accessories, lights, tripods, laptops etc. It is made of TTX01 high-strength resin and has an empty Interior. The case can fit into a car trunk or is stackable 2-high in a van. It is transported by 3 folding haul handles and built-in smooth-rolling wheels. The case includes 1 Safe Skies TSA approved lock. The case is backed by a lifetime replacement warranty. IP67 military specification is an international standard IEC 60529 that classifies the level of protection that is provided against the intrusion of solid objects or dust, accidental contact, and water. The first digit indicates the level of protection that the enclosure provides against access to hazardous parts and the ingress of solid foreign objects. The rating of 6 indicates the highest level of protection - no ingress of dust, complete protection against contact. The second digit indicates the protection of equipment against harmful ingress of water. The rating of 7 (out of 8) ensures that entry of water in harmful quantity shall not be possible when the case is immersed in water under defined conditions of pressure and time (up to at least 1.0 m of submersion).